Social technology has done two things: firstly, we are able to maintain larger numbers of weak social ties over greater geographical distances and through the ever more permeable walls of the organisation. Secondly, we are able to build and maintain more strong social ties across wider geographies and, sometimes, entirely independently of geography. We can be close friends and purposeful colleagues of people we have never ‘met‘. And it’s this that counts: it’s this that sits behind the transformation, because neither knowledge nor communities are geolocated anymore. This is why organisations need to do more than simply put systems in place. They need to change how they work and how we learn. No small ask. But failing to do so will squander the opportunity. Make no mistake: we are only at the start of the journey with Social. As technology continues to evolve and as our communities become ever more facilitating, sense making and able to democratise and own knowledge outside the influence of the organisation, only by rebalancing the social contract and creating a social enabled mindset and socially responsible business can we hope to survive. 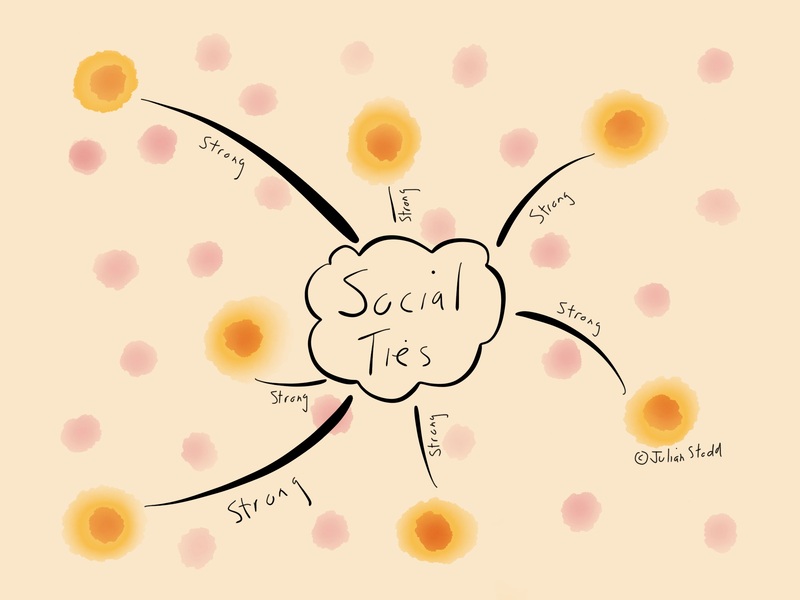 This entry was posted in Community and tagged Community, Connections, Meaning, Purpose, Social Age, Social Collaborative Technology, Social Ties, Sociology, Strong Social Ties, Weak Social Ties. Bookmark the permalink.